Toronto’s seventh annual Nuit Blanche (literally, “White Night” in French), an all-night arts festival, took place last Saturday. It was my second Nuit Blanche as a resident of Toronto. 1.) Toronto needs to stop being shy and own up to its coolness (Toronto, this former Brooklynite thinks you rock!) 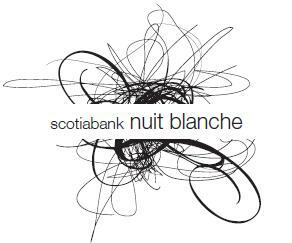 and make Nuit Blanche the prestigious, exciting event that it’s trying so hard to be. Stop being all, “Oh, that once-a-year, all-night-art-party? Whatever, I’ve got better parties to go to.” Own it. It’s okay to think it’s cool. I promise. 2.) There were too many huge line-ups for small-scale pieces that were intended to be experienced one at a time or in relatively small groups. In being such a huge public art event it needs more large-scale public art that can be enjoyed by the masses, well, en masse. 3.) Take more advantage of this being a night time event. While the majority of art pieces did focus on light in some major way, at times pieces came across as timid–not bright, large, or dazzling enough for their locations–or were drowned out by other lights, #114 “Beam of Underground Sun” is a perfect example. This piece by Toronto artists Arezoo Talebzadeh and Kaveh Ashourinia was one of the pieces I was most excited to see, it featured light beaming out of a sidewalk vent, like sunlight trapped underground, yet it was practically invisible unless you were standing right on top of it! 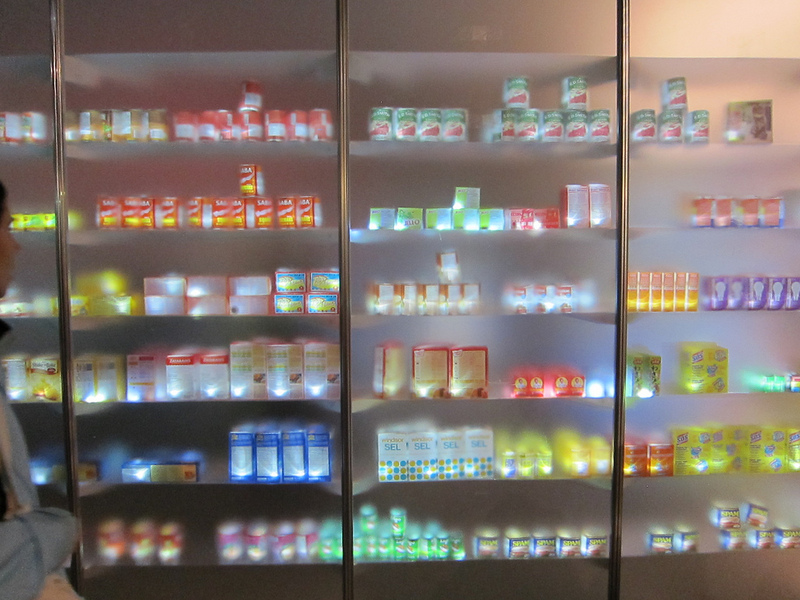 Convenience store products constructed out of sheets of mylar glowed like lanterns in this small shop constructed at the Bay Adelaide Centre. The public was invited to “shop” the convenience store, and by doing so gradually darkening it as the night went on. While line-ups to enter the store and take home part of this project were insane, the project itself was mesmerizing, beautiful and surprisingly profound. Peering into the store through the frosted plexiglass windows, the boxes, cartons and cans take on a mystical glow. They become even more mythical as they are carried away as lanterns, hanging on poles like just caught fish, the glowing boxes of Ritz Crackers and tins of Red Rose Tea becoming beacons of literal and figurative sustenance. A six-screen circular stand was set up in David Pecaut Square to project time-lapse video of produce growing on the artist’s family’s farm in Arizona. The videos showed one type of plant at a time growing from tiny seedling to ready to be picked size. Sitting down in the park to watch plants grow was one of my favourite parts of the night. The most surprising part came when a plant was finally full grown and its name came across the screen–the crowds began cheering and yelling out the plant’s name like it was some bizarro mashup of a quiz show and a rock concert–“Kale!! I knew it was Kale!! !” I was pretty thrilled myself that I knew broccoli was broccoli from only the first few seconds of watching it grow. I was really excited about this project and it did not disappoint. Late 19th and early 20th century films (I caught a few by Georges Melies,and Segundo de Chomón) were shown along with live piano accompaniment. I was completely amazed by the special effects these early film makers were able to pull off with the film technology they had available to them at the time – shrunken women trapped in vases, disappearing acts, dancing skeletons! It was absolutely fantastic! Early moviegoers must have been terrified! Though, actually, I think the live accompaniment was the part that stole the show. Until I saw “Strange Love/Strange Lives” I had never given much thought to what sort of music would go along with silent films. It was much more sedate that I would have imagined; more like chamber music than a modern movie soundtrack. It was a treat to have gotten to see these films the way they would have been seen over one hundred years ago, on the big screen, with a piano plinking away.